It is safe to assume most organizations today struggle to break down the barriers of business silos. Silos are more often than not the result of leadership or management teams that are driving against competing agendas. 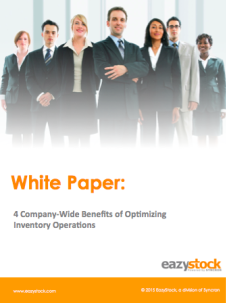 This white paper breaks down the 4 company wide benefits to aligning those competing agendas and optimizing your inventory operations. Learn about the areas in your supply chain where you can break down business silos and understand the 4 types of business stake holders than benefit from optimizing inventory operations. Each stakeholder in your supply chain can benefit from people, process and technology alignment.